It's Walky! » You’re embarrassin’ me. Hey, it’s Chloe. At the time I thought of her as sort of a reincarnated Ruth. Pissy, sarcastic, not dead, etc. That’s why, years later, I decided in Dumbing of Age to make her the Residence Manager in charge of Ruth. I thought it appropriate, as she was kinda the UberRuth. (Plus the “Crazy Canadians” line.) However, the, uh, needs of the story required her to be not so effectual at her job, so Dumbiverse Chloe never got that sardonic edge. Oh well. 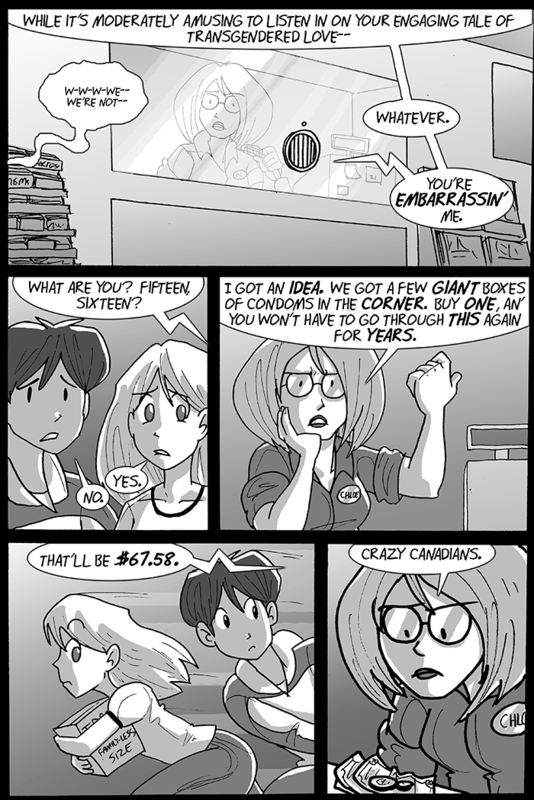 And this is the second time I use “transgender” as a verb in this webcomic. Argh, you’ll figure it out eventually, kid. Tomorrow, back to horrific vision strips. When young I never went to my regular pharmacy to buy these. Embarrassing enough for us introverts to be buying them in front of a person–better to make it a stranger. Yet another thing to like about self checkout kiosks. The computer doesn’t judge you. You sure about that? The coupons they automatically print out are a little too on point sometimes. Plus at CVS, you get the added bonus of a receipt that prints for 5 minutes and ends up being longer than your body . I may be older than you, as the time I’m speaking about predated UPC scanners. I never had a cashier call over the PA for “a price check on condoms”, however. AKA: every emergency room nurse ever. …years? Don’t they have an expiration date? I just looked it up, and apparently they can be good for up to five years. Improper storage can shorten that a lot, though. I’m pretty sure Joe keeps several of them in his wallet. I’m too lazy to find the original strip, did it not used to have an H? If it causes harm, I will gladly change it! I just didn’t want to brick over my ignorance. Technically, you’re using it as an adjective here. The “You’re embarrassing me” line has really stuck with me over the years. I mean, let’s not rule out the possibility of her growing into a sardonic Chloe, especially after a Residence Manager job. The box of condoms needs an oversized comedy prop tag. Too bad Chloe has never heard the whole story. Is this an actual thing with the store clerk in a glass box? In areas with higher crime rates. Depends on what kind of neighborhood the convenience store is in, but… yes. Yes it is. Convenience stores are somewhere in the top 5 list for “rob a [place]” fill-in-the-blank. I’m guessing some convenience stores have their clerks in a glass box, but I’ve never been to one of them. The only places I’ve ever been to with that setup are movie theaters. I suppose it’s not all that odd. It’s just something that I associated with my childhood (1970s), when banks, post offices, ticket offices, etc were walled off with “bulletproof” glass. Presumably it’s also less because desperados are constantly running in and out with guns blazing and more because it gives the clerk peace of mind and the owner lower insurance rates. Trans terminology has evolved very very fast since the early 2000s, and if you haven’t been along for the ride the entire time it’s easy not to realize how quickly some of the things that were totally acceptable as little as 15 or so years ago have changed. (This isn’t meant as a criticism of that, the whole rapid shift is a sign of just how amazingly the number of people being open and honest about who they are has grown for there to be these conversations about how the terminology can be better.) So you weren’t doing as bad as you think! Yeah, I had remembered that this word’s acceptability had evolved, but at this point in my life, I’m bad at remembering whether it was in the past thirty years or in the past twenty, and it felt like “an excuse!! !” so I didn’t bring it up. Speaking as someone who is trans, even to the point of having been on hormone therapy, I try to make it my personal policy not to get upset about people’s terminology unless they seem to be malicious / dismissive with it. If someone is genuinely trying to be nice and respectful, then that’s enough for me. I’m still not sure if I prefer this version of Chloe or the DoA version of her better. Huh, in the last few pages I was thinking “you’re not the only guy to compare ding-dings with his girlfriend, buddy” so it’s nice to see that acknowledged on-page.